10 Good ways to Support the DUCC Community! Talk it up! Diaconal ministry has been called, “the best kept secret in the United Church.” Making the work of diaconal ministers visible is an important way to support the community and strengthen God’s work in the world. Consider inviting someone to discern if they are called. Become a member! It is easy and with a sliding scale from as low as $10 annually, it is affordable. Membership fees are tax deductible. Make a Donation! DUCC is a charitable organization and receipts are issued. Donations enable additional work of education, advocacy and community building. Add your profile! This site is frequented by inquirers and others wanting to learn more about diaconal ministry in the United Church. Your story is important in reflecting the breadth of our community. Pass on information! When you hear about news of interest share it: jobs, volunteer opportunities, updates on members, ideas for newsletter articles, regional gatherings, photos. Send a change of address. The database can only be accurate if you help. Keeping your information up to date saves money. See the Contact Us page. Pray! Keep the community, its members and the work in your prayers. Sign up for a monthly reminder to pray for Diakonia on the 26th of each month. See the prayer cycle for more information. Like us on Facebook! DUCC is awesome, let others know. Organize a regional gathering! You could lament that no one is doing anything to build up the community in your region or you could do something about it! It doesn’t have to be complicated. Volunteer! Join one of the existing committees or work groups. Be seen! Attend the National Gathering or one of the International Gatherings. Sylvia Thompson was a great supporter of the DUCC community. She kept in touch with colleagues, organized the DUCCs in Saskatchewan, was the diaconal representative on Church committees and attended National Gatherings and DOTAC. She also doggedly stayed true to her commitment to work for social justice. 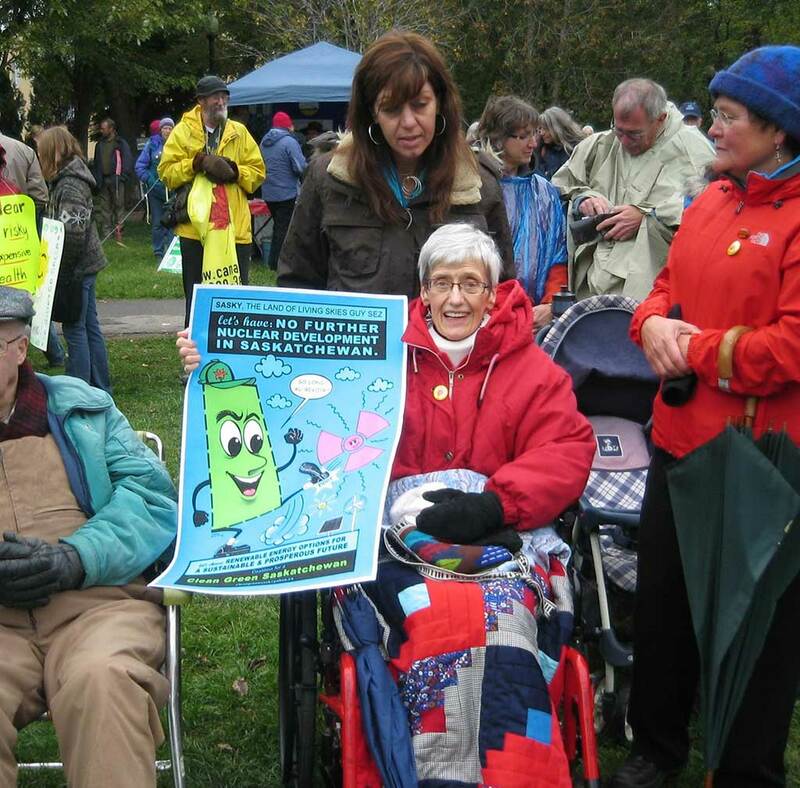 This picture was taken at an anti uranium rally just a few months before her death from ALS in 2009.